If you install a new operating system, change the hard drive on your computer, or even change computers you can use either of the following methods to reactivate your license. Note that the following apply only if your computer retains the name it had when the license was first activated. Method 1: In the Install License dialog box, click Load License. Browse to a backup of the license file for your add-in and open it. Method 2: Using the license key you received in the email when you purchased the add-in, activate the license again. As long as the name of the computer has not changed the license will be reactivated. This reactivation does not count against the number of activations allowed for the license key. The following list outlines the procedure for transferring a fixed license from the original computer it was installed on to a computer with a different name. Note that you are limited to a single license transfer per computer. If you have a multi-license key (e.g a 10 license pack), you are limited to that number of license transfers (e.g. 10 transfers). 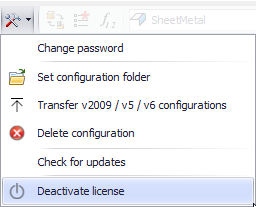 In the add-in, find the locaton of the Deactivate license command. See the Help system for the add-in to locate this command. When the Install License dialog box is displayed, click Uninstall License. Confirm that you want to deactivate the license on this computer. Install the add-in on the new computer and activate the license as outlined in Installing a Fixed License.